Includes all required materials both printed and in electronic format. With this combination you can choose the media that is most convenient to you at the time. Use the search engines and software resources from the computer, while you work through the lessons, assignments and quizzes in the interactive online classroom. And when you are away from the computer, study with the printed texts, table sections, and workforms. This course is also an ideal refresher for those who have been away from the topic for some time, or just want more practice and perhaps see other approaches. For those with this experience already, you might just go straight to the quizzes and then fill in the training as required. Questions and comments from more experienced navigators would be a welcome and beneficial addition to the discussion groups. Most people doing the course intend to use the knowledge for actual navigation at sea, but we do often have people learning cel nav without that specific goal. It is a fascinating subject in its own right. Amateur astronomers, school teachers, kayakers, and others just interested in the sky and this subject have taken part. It is a very rewarding exercise. Estimated to be about 30 hours of your time, depending on how much optional material you wish to cover. You work at your own pace on your own schedule. You can start at any time, and submit quizzes and discussion any time of day or night. The lesson quizzes must be submitted sequentially. You have one year to complete the course, or request an extension if needed. 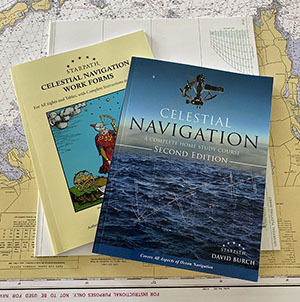 This course covers all aspects of practical celestial navigation, starting from the very basics and ending with all you need to safely and efficiently navigate an open ocean passage. Please read the general description of How the Courses work. You can sign up for the course anytime once you have purchased it. The celestial course builds progressively on previous lessons. An experienced navigator could jump to special topics by just submitting the earlier quizzes, but those new to the subject should study the material sequentially and post questions as needed. There are no formal prerequisites for the Celestial Course. We do basic plotting using parallel rulers and dividers, but that is also explained in the course. There are no math requirements other than addition and subtraction of angles and time, and we review that in detail in Lesson 1. You do not need a sextant to do the course, as explained in the FAQ. In many respects, celestial navigation is "easier" than coastal navigation, but the knowledge is accumulative. It is valuable to work as many as possible of the practice problems in each lesson. ...please review the Lessons tab to see other topics covered. This course will prepare you for the celestial navigation certification tests offered from any organization. We offer two types of certification tests ourselves, either the Starpath certification or the official US Sailing Certification in Celestial Navigation. The Starpath certification is recognized internationally through the the International Association of Sailing Schools.